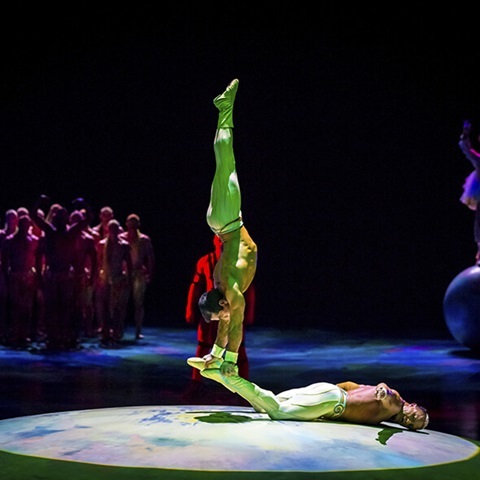 Mystere by Cirque Du Soleil Las Vegas is the classic must-see production directed by Franco Dragone. The show combines the powerful athleticism, high-energy acrobatics, and awe-inspiring imagery that have become Cirque du Soleil’s trademark. This Las Vegas show is performed exclusively at the Treasure Island Hotel and Casino within a 1600-seat theater custom built for the show. Audiences are won over by the unique mix of circus skills, street theatre-style comedy, elaborate sets, and colorful costumes. Mystère is an amazing theatrical production that features a story of two babies who discover a whole new world packed with unique creatures and brilliant colors, encountering a clown, acrobats, dancers and musicians on their way. Red Bird: The Red Bird leaps ever higher in his futile attempt to take to the skies. Still convinced he can fly, he struggles against his fate. Les Bébés: Always in search of warmth and food, the babies represent the primitive human state: selfish and hungry. The Birds of Prey: The ever-present and unpredictable Birds of Prey fly furiously through the world of Mystère. They can be graceful and serene, but when hungry they will attack, devouring their prey with delight. The Lizards: This chameleon can completely disappear before your eyes. But when it skitters about in its reptilian dance, the lizard shows off its shiny green skin with flashes of scarlet. The Chinese Poles is described as “a symbol of organic life which feeds on itself as it grows, like sprouting vines”. This act begins with a set of four silver poles that stand waiting for the characters known as Double Faces, whose masks make it look like they are looking at the audience even when they turn the back of their heads to the crowd. The performers to climb up, jump between, and slide down the four adjacent poles. The Hand-to-Hand is an incredible act where two performers stand center stage on a rotating dome. Using only their strength and bodies to place one another in incomprehensible positions, they achieve perfectly balanced poses. The whimsical costumes in Mystère, designed by Dominique Lemieux, are inspired by nature. For example, The Firebird has red feathers and accents, giving the impression of embers flying in the wind. The original score of Mystère was composed by René Dupéré. In 1995, the score was revised and captured in the album Mystère: Live in Las Vegas, a live, in-house recording of the new score. The album, released on November 12, 1996, features Nathalie Gauvin and Wendy Talley on vocals. After the release of the live album, the music was rearranged and altered once again. Although the album resembles the current live music closely, it is not identical. 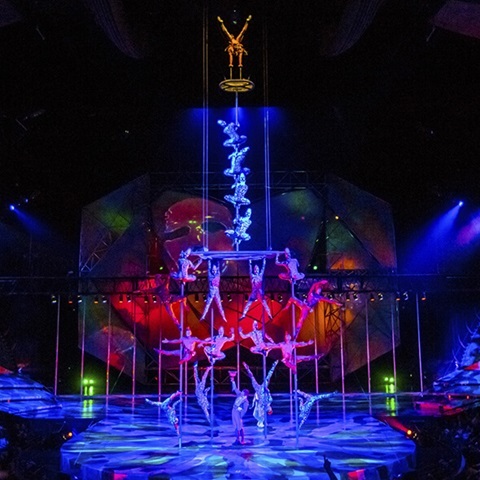 Honored eight times as "Best Production Show" by the Las Vegas Review-Journal, Mystère has an international cast of 75 performers featuring dancers, singers, musicians and champion-caliber acrobats. Mystère welcomes audiences of all ages. Note: A ticket must be purchased for children over 1 year old (even if child will be sitting on a parent’s lap during the performance). This 90-minute show (not including intermission) goes live 5 days a week at 7:00 PM and 9:30 PM, Saturday, Sunday, Monday, Tuesday, and Wednesday and is dark on Thursdays and Fridays. No flash photography or cell phone usage is allowed. Ticket prices start at about $71 for standard seating and prices go up from there. No V.I.P. experience is available. Ticket Starting Price (Full Price) – Approximately $71 for standard seating. * The idea for Mystère started around 1990. It was originally planned for Caesars Palace with a theme based on Greek and Roman mythology. * The Mystère stage floor is made of a layer of Base Mat, which is rubber made from recycled old tires and sneakers. This helps give the stage some bounce for tumbling. * The largest drum in Mystère is the ōdaiko, which is 6 feet (1.8 m) in diameter and 15 feet (4.6 m) in length, and weighs half a ton. Due to the large size of the drum, it had to be brought into the theatre during construction. * The Bungee costumes used in Mystère each have over 2,000 hand-glued sequins.